In exchange for giving Forest City Ratner more than $300 million in public subsidies to build the Barclays Center in downtown Brooklyn (and that's not counting additional tax breaks and below-market land), the developer promised to give back to the community, including affordable housing, and new railyards. Precisely none of that has materialized. The only tangible giveback to the community? A storage meditation room. The New York Times has a good summary of the deals and compromises that led to one of the strangest and least-known corners of the Nets' home. It was originally intended to be a place of worship, a concession obtained by local pentecostal pastor Herbert Daughtry, in exchange for his community group's support of the arena. Instead, it's served mainly as extra building storage—folding chairs, wheelchairs, and luggage are often found inside, and fans remain largely oblivious to its existence. Rev. Daughtry is the central figure here, and a fascinating one. The 83-year-old leader of the Downtown Brooklyn Neighborhood Alliance was one of the arena's biggest cheerleaders, at a time when local opposition to the project was fierce. Daughtry's critics call him a sellout. Forest City Ratner is the DBNA's biggest donor, and according to Atlantic Yards Report has funded him to the tune of well over $1 million since 2006. His family members, including his wife and two of his daughters, run other programs funded by Forest City Ratner. Daughtry's supporters say he's done the best he can to gain at least some concessions from the developer. 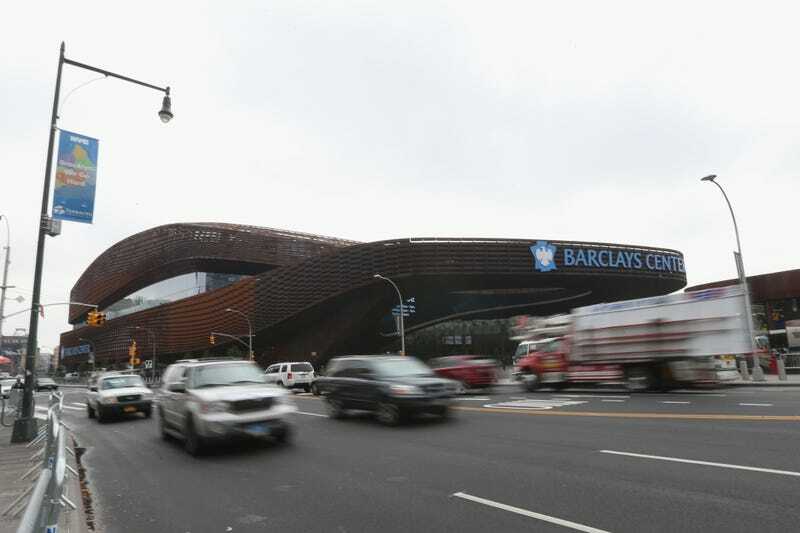 One of those he sought was a chapel in the Barclays Center. But, ironically, because of the public money used to build the arena, anything religious wasn't a possibility. So it became the non-denominational "meditation room." "The idea is to say to people there are values in reflection, contemplation," Daughtry told Brooklyn Paper a few years back. And indeed the room is getting some use: when the Times reporter visited, he learned that some of the arena's Muslim employees use it for prayer (unless an empty stairwell is closer). Still, it remains the only tangible return on hundreds of millions of dollars given to already-wealthy developers and sports team owners. Most fans have no idea that it exists, and even if they were to seek it out, it's locked up tight—a key must be obtained at a separate office. It's also not particularly peaceful—just off the ground-floor concourse, the crowd noise is audible. The only concession to a meditative state of mind: the cinderblock walls have recently been painted lavender. "God will be angry if we misuse the people's resources," he said, referring to the promised affordable housing, open space and economic opportunity for the thousands of jobless in the vicinity of the arena. "Generations of the yet unborn will rise up and curse this project."